Some of the best sushi establishments are tiny places with one bar and perhaps a few tables. For the full experience, it’s best to sit at the bar so you can watch the chef at work. The general rule of thumb for behavior is, the more serious the sushi, the quieter you should be. While some places are relaxed and casual, famous sushi chefs have been known to frown upon boisterous customers, so it’s best to take your cues from the mood of the crowd. 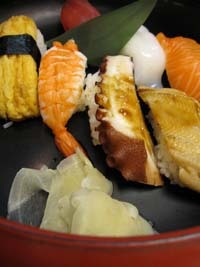 The joy of the sushi experience is in the quality and variety of the fresh neta (sushi topping). The best restaurants feature freshly caught seasonal fish, so unless you’re an expert, the recommended route is to simply say “omakase,” which means “I leave it to you.” This allows the chef to serve what he considers to be the best neta in the order of maximum enjoyment. There are three levels of omakase sushi: nami (standard), jō (premium) and toku-jō, with ascending price levels. Toku-jō will include more extravagant ingredients such as toro, (fatty tuna), ikura (salmon roe) and uni (sea urchin). An omakase selection typically consists of 7-10 pieces, and you can always order seconds of a favorite, or any varieties that were missing. Sets usually include tamago (egg omelete), which sushi aficionados use to rate the quality of the restaurant. If you want to order a lá carte, it’s best to start with lighter toppings such as white fleshed hirame and tai, then move on to medium neta such as maguro (tuna), working your way up to the stronger and richer-tasting toppings, finally ending with ikura and uni. The classic way to serve sushi is on a fresh bamboo leaf. 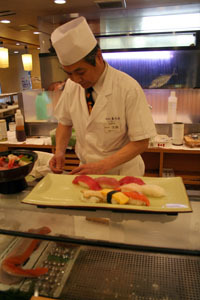 The chef places each nigiri as it is made onto the leaf, which is typically set on a raised shelf just above the counter. It’s best to eat it promptly to both show respect to the chef and to savor the nigiri at its’ freshest. Do not sit idly, chatting away with your partner while the neta dries out and the rice loses the warmth of the chef’s hands. Omakase sets are either served one or two pieces at a time in this way, or arrive together on a wooden or ceramic platter. It’s perfectly polite to use your hands to eat sushi, which had its origins as a street food during the Edo era. Pinch the nigiri with your thumb and middle finger, while keeping the neta in place with your index finger. Then turn it upside down and dip the neta lightly in the soy sauce, turn it upright again and place the entire piece in your mouth. This might take some doing, and I admit that at times I’m not able to do so. But biting the nigiri causes it to crumble, so one option is to cut the rice into a manageable portion, eat it first, and then eat the neta with the rest of the rice. To Wasabi or not to Wasabi? I’ve seen Westerners place a huge amount of wasabi in their soy sauce, and then drench the nigiri in this mixture. At a fine sushi establishment, this is seen as a waste, or even, crazy. How can you taste the subtleties of the neta with so much wasabi? Also, a dab of wasabi is already placed on each piece of rice (while some fish, such as saba (mackerel) are served with grated ginger). Fine places also use freshly grated wasabi, which has a finer and brighter flavor than the imitation wasabi available in the West (which is actually horseradish), so a little goes a long way. Truthfully, living in the U.S., I fully understand why my friends have this habit. The neta is virtually tasteless, has little texture and at worst, is not even fresh. But at fine sushi-ya in Japan, there’s no need to cover up all that wonderful flavor. Like the rest of the world, Japan is changing, and these guildelines (which are for Tokyo-style nigiri zushi) are not set in stone. It is, after all, important to enjoy sushi the way YOU like it, and this article is not meant to make visitors uncomfortable or nervous. We just hope this information puts you at ease and contributes to your overall enjoyment.